It is equipped with a hydraudic self-raising mechanism and a frequency-converting slewing mechanism.The electric control system of the tower crane adopts the advanced ‘PLC+frequency converter’ control mode of the present day.Which has realized the stepless speed regulation and greatly improves the reliability,maneuverability and stability of the control system and the work efficiency of the tower crane. 1.The rated load moment of Tower Cranes 630KN. m, the maximum lifting weight is 6T, and the maximum working range is 53 meters. The end lifting weight is 1.3T. The lifting height can be41.4 meters when standing stationary alone, and 152 meters when anchored, suitable for the construction of buildings lower than 50 floors. 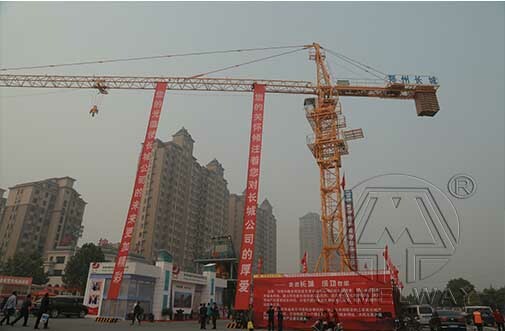 The structure of this tower cranes is rational, for the main functioning steel parts, such as the tower and the crane, are made up of seamless steel tubes with proper hardness, little wind resistance and a pleasant appearance. Crane adopts the jin kui brand electric parts which are famous in China. These high-quality parts can serve for a long time, reducing breakdowns and improving efficiency. Crane has helmet structures with two hoisting points, adopts small trolleys, hoists with upper slewing liquid pressure, and it can be installed quickly and conveniently. What Should We Do When We Can’t Open Concrete Mixer Hydraulic Cylinder ?